Join the City Council of Cathedral City, Mural Artist Rick Rodriguez, World Boxing Champion Tim Bradley and Mixed Martial Arts and Ultimate Fighting Championship Competitor Kevin Luke “Cub” Swanson for a “Mural Artist and Celebrity Signing Ceremony” on Wednesday, October 24th starting at 2:30 p.m. and located outside of One Eleven Conditioning Club, 68571 E. Palm Canyon Drive in Cathedral City. The artist and celebrities will sign the mural that is now completed on the wall outside of the fitness club facing Highway 111. The City Council will be present to dedicate and honor the mural project. 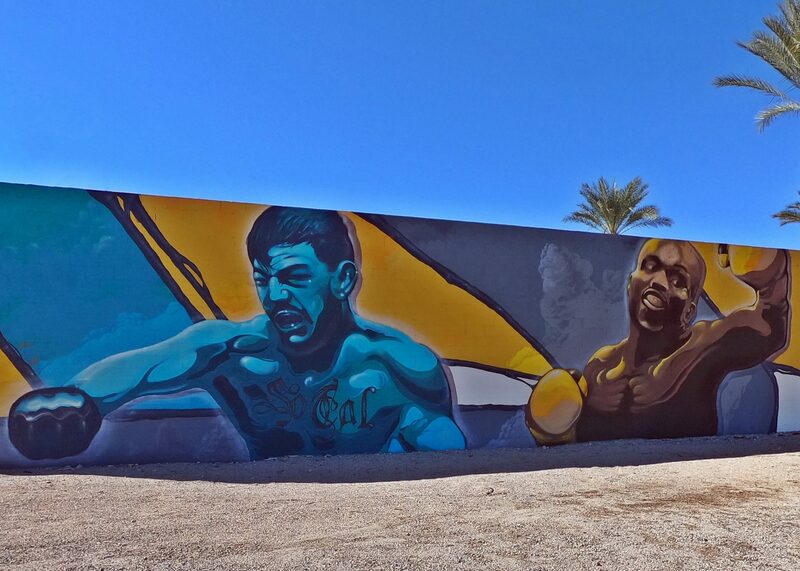 The mural of these two sports legends is part of Local Legacy Mural Program coordinated by the Cathedral City Public Arts Commission in its goal to incorporate art into the City’s commercial zones. Artist Rick Rodriguez, who created the sports mural began painting on July 10, 2018 and completed it several weeks thereafter. The ceremony on October 24, 2018 will bring the artist and the sports figures together to recognize their wonderful achievements.